Based in Irvine, CA, First Foundation Bank has various branches around Southern California. Opening a new deposit account at the bank used to involve mailing paperwork to the corporate office for approval. If anything was missing, it would also have to be mailed in. Here is how Laserfiche automated the whole process to reduce approval times from a few days or weeks to hours. When a customer wants to open a deposit account, he arrives at one of the bank branches. A private banker gives the customer forms to fill out. The customer fills these out and can also email additional information such as a statement from another bank. Documents that arrive by email are dragged and dropped into the deposit account’s Pending folder in Laserfiche. Upon import, the private banker fills out the metadata. 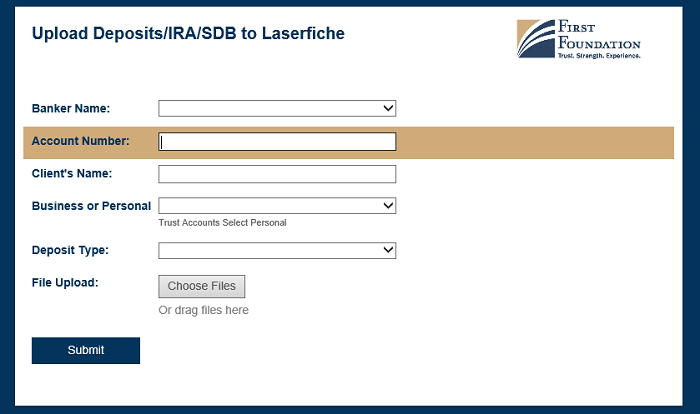 Electronic documents can also be uploaded through Laserfiche Forms. The private banker logs into the bank’s intranet site and selects the link for adding new documents. He selects whether the documents are electronic or paper. If the private banker selects the electronic documents option, he is prompted with a form to fill out. If the document is for an existing customer, the Account Number field must be filled out. If the document is for a new customer, than that field can be left blank and the Client’s Name field must be filled out instead. At the end, the private banker uploads the appropriate document and submits the form. The attached documents are automatically saved in the customer’s folder in Laserfiche with metadata applied based on information from the form. Paper documents are scanned onto a network drive. Laserfiche Quick Fields Agent, an automated data capture and storage tool that helps you extract information from documents, organize them, and store them in a Laserfiche repository, runs regularly, processing documents from the network drive and importing them into Laserfiche. Before the documents are scanned, though, the private banker fills out a Laserfiche form with information that needs to be included in the document’s metadata. This information is also used in generating a barcode coversheet. Once the form is submitted, Java Script generates a barcode coversheet with the information. The private banker prints the coversheet and includes it with the particular document that needs scanning. Many such documents can be scanned in one batch as long as each has a coversheet. 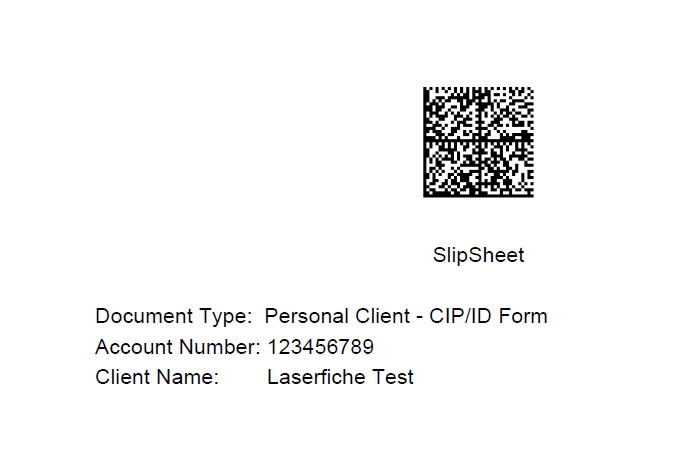 Laserfiche Quick Fields populates metadata with information stored in the barcode and deletes the coversheets. 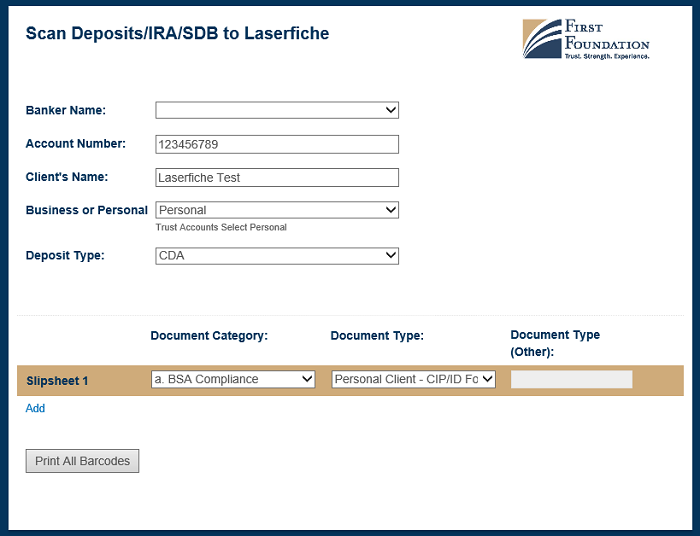 Once the documents are imported into Laserfiche, the private banker changes the Deposit Account – Approval Status field to Review. Laserfiche Workflow then sends an email to the Quality Control group letting them know that a new account is ready for their review. 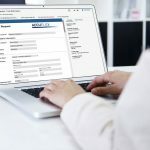 A quality control specialist claims a document and selects his name from a list field in the template so that the others know that the new account is already being worked on. The quality control specialist creates the account in the Fiserv core system and then performs a first review of the documentation. If he finds something wrong, like a missing signature or form, he selects Exception in the Approval Status field. Laserfiche Workflow then sends the documents back to the private banker who must correct the problem and submit the documents for another review. If the account passes the first review, the quality control specialist selects Conditional Approval in the Approval Status field. This action triggers an email notification to the private banker. The documents are automatically moved from the Pending folder to the Accounts by Number folder and the Account Status field is changed to Open. The private banker then notifies the customer that the account is ready to use. Once the documents are moved to the Accounts by Number folder, all rights, except for read, are deleted. The only person who can edit the documents is the quality control person during his final review. Accounts that have had a successful final review have a Final Approval status applied and remain in the folder until they are closed. 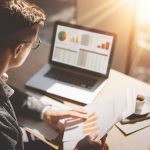 If a customer closes an account, the private banker notifies the quality control group, which marks the account closed in Fiserv and changes the Account Status field on the customer’s Laserfiche folder to Closed. 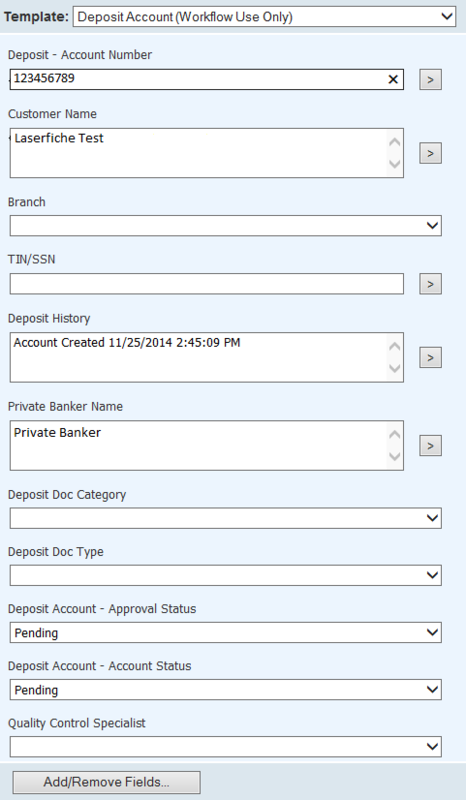 Throughout the process, the Deposit History field records every action performed, along with the date and time. New accounts can be opened much faster than before since documents don’t have to be mailed back and forth between the branches and main office. What used to take a couple days or weeks, now takes a few hours. Documents are never lost or misfiled since everything is automatically stored in the appropriate place and accessible only by authorized users. It is very easy to see a particular deposit account’s progress simply by looking at the document’s Deposit History field. 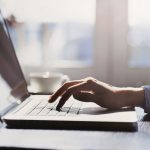 Interested in automating the new account opening process at your organization? Get a free demo today.